If you're looking for the real Cowboy Bob Sorensen, you found him. This is the hub of my selected Weblogs and other material. On February 21, 2018, a man beloved by millions of Christians died. 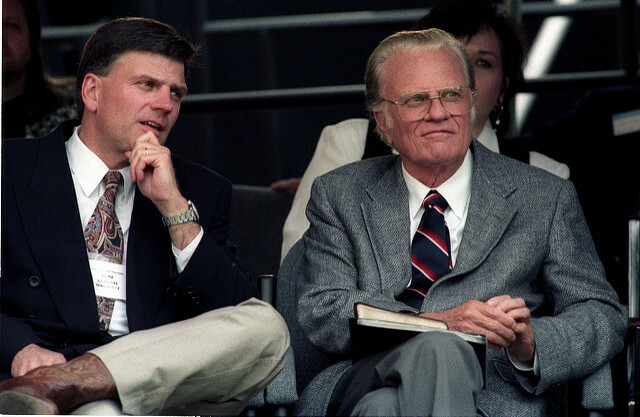 Billy Graham was 99 years old, and spent decades preaching the straightforward gospel. I am not going to give you a mini biography since many other people have already done that. However, I have some things to say about him. Interesting that my father, a pastor in the ever-increasingly liberal United Methodist denomination, was fond of this Baptist preacher. People packed out entire stadiums to see Billy Graham crusades, and many of those were supporters, some excited about his celebrity status, Christians bringing friends, the curious — and those who didn't know why, but were drawn by the Spirit of God. Although I had never attended a formal crusade, I think I was taken to see an associate of Graham, Leighton Ford. Back when I was a youngster, I was taken to see a movie from World Wide Pictures, the cinematic division of the Billy Graham Evangelistic Association. Not sure which one it was, but I suspicion it was For Pete's Sake. That came out in 1966, so that's probably the one. Those movies were shown in cinemas. I went forward for the invitation to receive Christ, but looking back, I think I was more interested in getting the free literature. There were lessons involved, and I had a subscription to their Decision magazine. Many years later, I was involved as a counselor of sorts to talk to people who came forward at another movie. I think it was Cry from the Mountain. We were instructed to do something that I did not like: if people had a church background, send them to that kind of church. (One guy said, "Well, I never!" Apparently, he thought it would be a proselytizing free-for-all.) If they came from Catholic, send them there. Methodist? Back to that one. And so on. But I was more interested in sending people to Bible-believing churches instead of apostate mainstream denominations. I think it's a no-win situation, someone is going to be upset. If Billy said, "The Roman Catholic religion does not teach the true gospel" and actively opposed them, then that huge organization would have easily been able to make trouble for his crusades, movies, and so on. I'm guessing, but perhaps he was hoping that if people knew the gospel, repented, and read the Bible, they would leave false religious systems. Some folks called Graham a "false teacher", but those seem to come from folks who adhere to specific religious beliefs, including legalism. Where? This fiery preacher believed in the Trinity, clearly taught that Jesus is God the Son, believed in the bodily Resurrection of Jesus, and held to basic Christian tenets. (I have heard the "false teacher" claim made against other people, including myself, who also hold to the truth of Scripture.) Graham's ecumenicism was unfortunate, even harmful, and angered people. I do not know what I would have done in similar situations. Also, he did not use his status for many social causes, and primarily focused on the gospel, though he did preach against Communism and racism. Graham met with many world leaders as well, and some were rather unsavory characters. It's easy to criticize him without knowing all the details, and not having any experience of being in his rather unique position. Also, I was not happy with how he was unconcerned with the foundation of the Christian faith, which is found in Genesis and special creation. Some anti-creationists milked that view in a weak appeal to authority, using his death to advance their own agendas. Essentially, "Since the famous Billy Graham wasn't concerned about creation, then it must not be important". (Interesting that creationary organizations did not worry about his views in their tributes.) There are several teachers who are solid on Scripture but weak in that area, and there are others who hold proclaim special creation. Views on ecumenism, creation, and so on are causes for concern, but do not negate the faith of a teacher or other individual. As I have written several times before, people often do not think about what the Bible says about origins, or the importance of Genesis. Those who have been shown the truth of biblical creation science teachings and persist in old Earth or theistic evolution, however, are actively rejecting the clear teachings of God's Word. I view theological teachings of people like that with suspicion at best. Remember when leftists were angry because Mike Pence would not dine alone with any woman other than his wife? The reason for this is to avoid potentially compromising situations. I first heard of that from Josh McDowell. This principle is something that should not only be common sense, but was in place by Billy Graham decades ago! His son Franklin was carrying on the work from 2001. Franklin was a prodigal son for a few years before giving his life to Christ at age 22. He is more socially and politically involved than his father. Billy Graham taught the straightforward gospel message. He was also known as a man of integrity and high morals. When the US Congress was honoring him, viperine atheists were honoring their father down below and complaining. It's who they are and what they do. Yes, he had some failings, what with being human and all. Graham had a big job to do, and was a very public figure. There were people who detested him because he did not to things, teach, or believe their way. However, I am certain that he heard, "Well done, good and faithful servant". Here are some links that I thought you may find interesting, and below them is a short tribute video.